Superior airflow efficiency is achieved thanks to the combination of a unique curved damper, larger vent opening, and collar placement. Allowing the dryer to perform at peak efficiency helps reduce lint buildup (and the resulting fire hazard), and it keeps dryer times low which reduces wear and tear and saves energy. Dryer exhaust systems need to be cleaned—from beginning to end—regularly. DryerJacks include special design features for ready access that is easy on cleaning tools. The ability to clean vents from both ends can be a major advantage for longer runs, and it is helpful for a thorough cleaning. Your natural intuition might insist that a screen exists to shield bird and rodent entry, but the building code clearly prohibits their use in dryer venting as they quickly get contaminated with lint. Special attention to the shape, position and how the damper rests inside the hood when closed, delivers a high degree of intrusion prevention without the use of screens. A water tight collar extends up through and above the nailing flange to prevent water intrusion in the exhaust duct. Tough as nails construction, built right here in the US, ensures a very long duty life. The tightly engineered housing, flange, damper and collar are all constructed of 26 gauge Galvalume®. 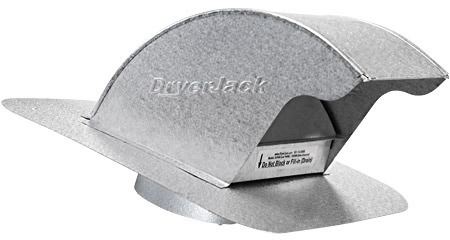 DryerJack hood features balance aesthetic objectives with application requirements. Rounded flange corners simplify handling, and built-in nail holes help speed installation. Typical roof terminations have been proven to restrict airflow to a dangerous level when it comes to venting dryers. 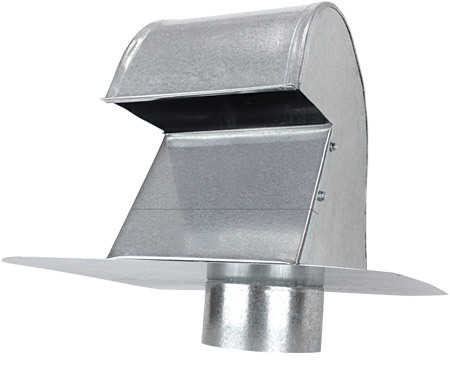 Poorly designed roof vents are more than just an eye sore; they are rarely duct cleaning accessible or pest resistant. DryerJacks deliver advanced performance for improved safety, efficiency and duty life. When I asked my HVAC guys to install the DryerJack, they were so impressed they insisted I tell them where I got it. They said it was easy to install, and it looks fantastic. Good price and perfect fit for a roof dryer vent. Installed easily. Our city inspector was really impressed with the DryerJack. His words, "Wow, this is perfect." It's well designed and well made, an excellent product. Thanks. Nicely fabricated of heavy gauge material and finish too. Will last a long time I'm sure. Highly recommended.